Shoot hoops, play hockey, kick a ball, play badminton, climb a wall! All this and more can be done in our air-conditioned gym. Whether you are having a party for 5 or 40, we can accommodate team sports, co-operative games, and fun, age-appropriate activities. Approximately 70X40 feet. One activities leader is included in the cost of the gym rental. With each gym rental, a trained activities leader is available to organize and lead active games and sports. Please include time for set up and clean up as parties are often booked back to back. A trained leader can facilitate the use of the rock climbing wall and the auto-belay system. (Please bring indoor shoes when using the rock climbing wall) The rock climbing wall will be unavailable from September 17th – October 15th 2017. Sorry for any inconvenience. Make your child’s next birthday party a splash! 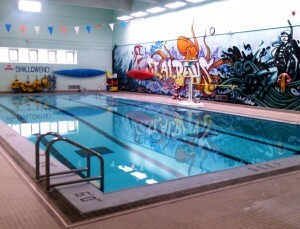 Have a POOL PARTY at St. Alban’s. Two lifeguards will be present for all pool parties. Pool safety regulations are being strictly enforced—refer to admittance policy in Aquatic Program information section. Alternate Saturdays/Sundays – school year only! The pool is unavailable for rental during the summer. This space is ideal for a group of 15-20. Great space for a birthday party. Function must be congruent with the mission statement of the Club. Fee must be paid in full upon booking. Please note, the Club is closed on Sundays in the summer.